A lot of my coworkers are setting goals for themselves this year to use more technology. One of my own goals is to use the technology I have in really fun and engaging ways. Recently, I’ve learned how to project my iPad to a larger screen. This is great for groups because it engages the kids so much! It especially helps my students on the spectrum who have trouble visually attending. Something like a book doesn’t hold my students’ attention. Once I turn to show other members of the group the page, the student has lost interest. 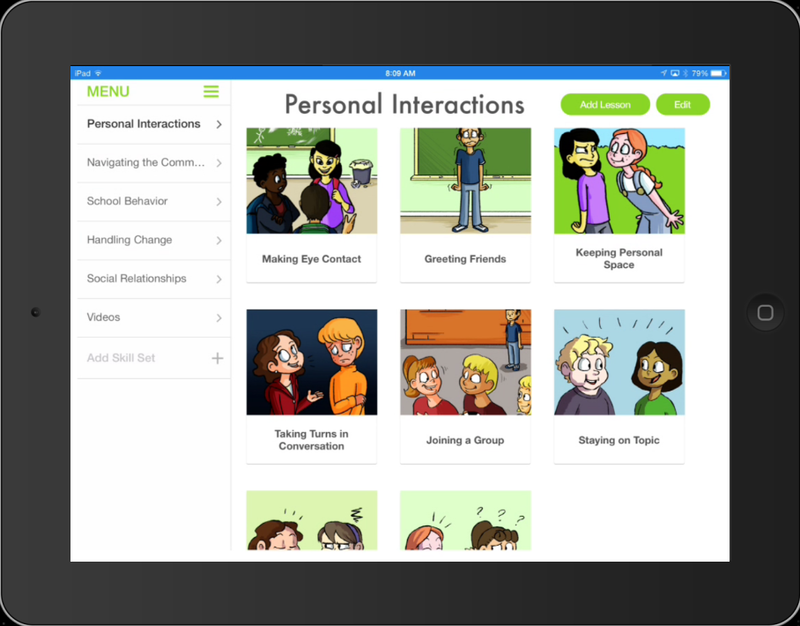 With the iPad I can read an interactive story and place the iPad right in front of the students who need it closer. Having a larger screen in the center really keeps the group’s focus. There are a couple of ways to project your iPad. First you need to figure out what type of screen you will use. In the program I work in, we are lucky enough to have a large portable screen called a TAPit. (read this post to learn more about TapIt). Some classrooms may have interactive whiteboards such as SmartBoards or Mimeo Boards. Many schools don’t have access to these types of technology so the other option is using another computer screen. Once you decide on the screen you will use, the next step is syncing your iPad. You will need something that allows you to do this. Apple sells adapter cords that can be hooked up to an actual projector. This may be a good option if no other technology is available to you. If you have a computer or interactive whiteboards, there is relatively inexpensive software that allows your iPad screen to show up on another screen (this is called syncing or mirroring). 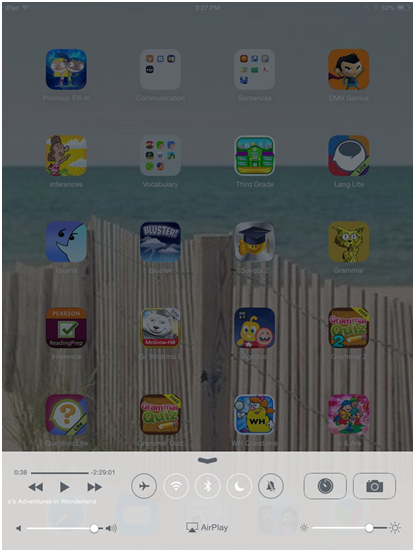 Reflector is software that lets you wirelessly connect your iPad or any device (iPhone or iPod Touch) to any computer, for $12.99. This allows you to use your iPad and it will show up on a larger screen. It comes with features such as recording, password protection, and syncing up to multiple devices. The best part is it syncs wirelessly, so you are free to move around. To use Reflector, first run the software on your computer. Next get out your iPad and swipe up from the bottom to bring up the control center. Click on the AirPlay button to turn on “Mirroring”. An option for which screen you want to sync to should pop up. Toggle the “Mirroring” switch to on. Now you are ready to go! 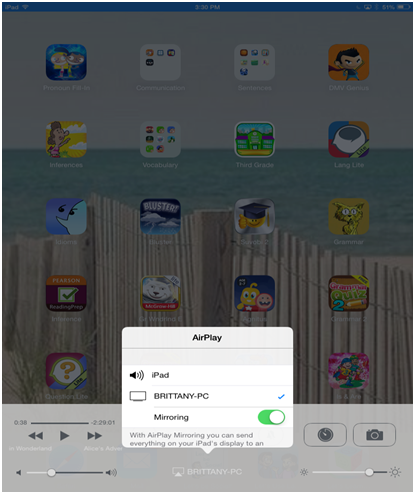 AirServer ($14.99) is another option that works just like Reflector to wirelessly sync your iPad to another device. Another similar software is X-Mirage ($16.00). Another option is Apple TV ($99) however this is pricey and requires a TV. Once you can mirror your iPad screen, the options are endless! You will be on your way to planning many fun and interactive lessons! Stay tuned for more ways that I use tablet mirroring. We’ve released an eBook – “The Ultimate Guide to the iPad for Speech Pathology and Special Education”. It has all the tips and tricks you need to become an iPad master. Best of all, it’s FREE. Grab your copy here.